Use the form below to contact accommodation Hotel La Diosa directly. Cahuita is a great place to get in some beach time. Playa Negra has black sand and is near good swimming areas, and there are white sand beaches found within the Cahuita National Park. The offshore section of this park hosts one of the country’s best coral reefs. Needless to say, it’s a good spot for snorkeling and scuba diving. Hotel La Diosa is set along Playa Negra. One of the few Cahuita hotels with direct beach access, Hotel La Diosa offers its guests an unparalleled place to relax and enjoy the mellow life in Costa Rica. It’s walking distance from town but is set along a quiet stretch of the coast, so stays here are generally quite tranquil. Accommodations consist of colorful, well-equipped bungalows. Every bungalow has a private hot water bathroom and many even have their own Jacuzzi tub – a welcome amenity after a day on the beach. Most rooms have air conditioners and all have fans, thereby allowing the indoor temperature to remain consistently cool. The bungalows range from one to three room options, with both queen size and king size beds. There are hammocks in the front and several have balconies with coastal views. Wireless internet is available throughout. Breakfast can be enjoyed in the hotel’s open-air rancho. Breakfast consists of gallo pinto, fruit, pancakes, toast and fresh Costa Rican coffee. During the afternoon guests can swim in the hotel’s pool or head to the beach for sun. Also on hand is a room where guests can to practice yoga or meditation. Cahuita, in the South Caribbean, is a truly charming town; a real Caribbean town where time seams to be stopped, with heaven on Earth beaches surrounded by dense tropical forest, shores of the turquoise sea, the black and white sand beaches and coral reef, more than an ecosystem is represented here. The Afro-Caribbean culture is everywhere; an African legacy reflected in the architecture, gastronomy, music, and in the people, whose roots come from turtle fishers that settled down three hundred years ago. 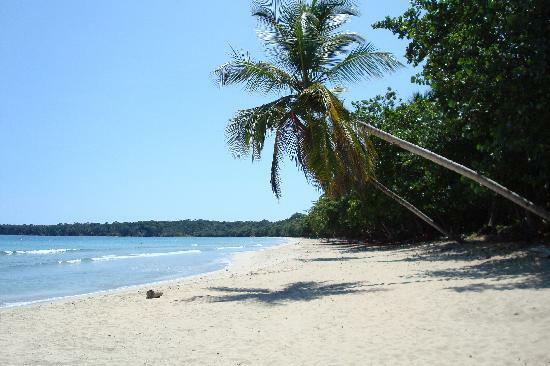 Nowadays, Cahuita is a multicultural town, with settlers from all around the world. Cahuita was baptized by the Miskito Indians, who were turtle fishermen. Cahuita in their language means “place were the sangrillos grow”. The sangrillo is a tree species with yellow flowers which is very common in this area. © costaricasmallhotels.com. All rights reserved.